The eBible is an App where you will really be immersed in the Bible. The eBible is full of lots of video, audio and eBooks. In addition, you will be able to create your own community of people around the Bible. In the eBible you can meet other friends and share messages and opinions about the Bible. Don't way longer to download ! You will enjoy the first Bible in history that is illustrated with thousands of images painting step-by-step the whole text of the Bible. This is a Bible with the unabridged text that is read by professionals accompanied with soundtrack and sound effects. This Bible provides pop-up windows with Biblical commentaries and videos with introductions. You will get immersed in the Bible much more than you have ever dreamed of. They are the whole stories of the Stories that the Bible has. For example: The Story of Adam and Eve. For those who are only interested in listening to the Bible, there is the audio section where you will find the complete audio of every eBook. Learning Units: The eBible project offers you Learning Units that are audiovisuals made for the exploration in depth in a concrete Biblical subject. The point of these Units consists on learning how to understand and value key elements of the Biblical History and the History of Salvation. These Learning Units show and analyze the religious and theological basis of both the Bible and the Jewish and Christian History. Biblitos: These are little audiovisuals that explore concrete elements and special events of the Bible treated from a point of view based on nowadays interests and preoccupations. You will feel that Biblical symbols are something tangible in a real world and the same time have a profound and current value. You will see how concrete elements like water, oil, bread, wine, sheep, light, night, Passover and Christmas are showed in their real appearance, but treated in their deep and unrealized Biblical sense. Finally, you will be able to understand the Biblical language from a viewpoint based on present social preoccupations. Lectios: The Lectio Divina is a methodical way of reading the Bible by waking up your contemplative and meditative skills. Biblical Values: These are Biblical Narrations based in a special Biblical Character who can be taken as a model of DIVINE AND HUMAN VALUE. Every special character of these Narrations shows an exemplary behavior towards others, the world and God. This is a space devoted for the interchange with other users of the eBible App. In this Social Community you can share opinions with other and you can make friends around your Biblical interest. You will be able to create your own Profile once you are registered. You will have your own wall where you can post your thoughts and show your activity day by day. You can follow other people and other people can follow you. The menu option of Community will be the TimeLine where you will be able to see what other fellows post and like. The BIBLITOS are a substantial part of the eBible project and are delivered in audiovisual format. Every BIBLITO is devoted to either a Biblical subject or a Biblical event, but focused from a nowadays problem. The BIBLITO reflects on a present-day element that appears in the Bible and deduces its symbology and ultimate sense. For instance, concrete elements like water, oil, bread, wine, sheep, light, night, Eastern and Christmas are addressed by combining its immediate reality with its profound Biblical sense. At the end, we are ready to understand the language of the Bible from the viewpoint of direct elements of the nowadays society. We have lots of strategies. That is called savoir faire. Read the Bible on your favorite device. Listen to the Bible in our audio full of effects. Choose! This App is full of instructive and thoughtful videos about the Bible. The eBooks of the eBible illustrate the Bible step by step. Make your own community of friends around the Bible and share God’s word with others. Leave your comments on every digital creation. Make a LIKE so that you attract your friends. 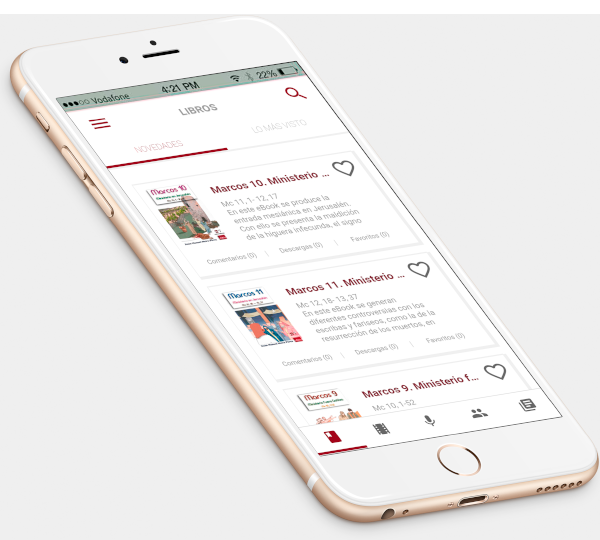 Check the menu of the eBible App and access to “Volunteers”. Be a Volunteer, contribute to our project, and you will have the eBible products for free. Feel free to explore the benefits of the eBible App.